So the newest and highly anticipated Hong Sister's drama Jeju Island Gatsby (Warm &Cozy) premiered its first two episodes on DramaFever Wednesday and Thursday. It's been two years since their last drama, Master's Sun, so I personally was quite looking forward to it. I'll give my initial thoughts on the first couple episodes here and once the drama finishes, I'll post a Drama Diagnosis for my overall review. There were a lot of positives about this drama. I do have a couple complaints, but so far the good outweighs the bad. First a brief summary: We start off 10 years in the past. Lee Jung Joo has travelled to Jeju to track down a boy she believes to be her twin separated at birth, Baek Geon Woo, who is a happy-go-lucky chaebol. Instead of writing her off as crazy he tries to help her find the truth and it turns out they're not related, but he's still nice to her about it. He teases her about hoping to run across her in the future and her turning into someone great. Long story short she does run across him in the future and they both remember each other. Geon Woo goes through the worst day in history where she gets bamboozled by her cousin who tricks her into buying a delapitated house in Jeju, she finds out that her boyfriend lied about being in Japan and got married to a different girl, and she gets fired from her job. 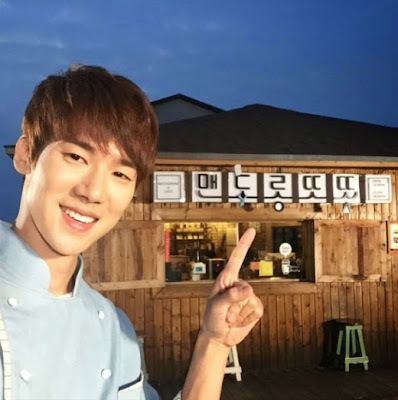 Geon Woo happens to own restaurant on Jeju right near Jung Woo's new house. Because she has no other prospects, Jung Joo decides to try to turn the delapitated house that she now owns into a Cafe. Also it's a long story but Geon Woo thinks Jung Joo is dying and feels especially obligated to help her. To start off with the good: I love the feel of this drama. It's very tropical with the music and the setting and already I'm contemplating how I could feasibly quit my job and move to an island to become a bartender. It's a tempting lifetstyle. The mocha coconut Frappuccino I'm currently drinking is definitely not helping. Also Yoo Yun Suk is adorable as Baek Geon Woo. I was heartbroken when I learned Kim Woo Bin would not be playing the role, but I have to admit Yun Suk is pretty great in the role. I love the twist on the cliche chaebol. He is warm and fun and friendly rather than cold and calculating. It's refreshing and goes perfect with the Jeju Island theme. He seems immature and selfish at times, but so far his heart always wins out over his selfish desires. I want to be his best friend. Also I really like that he and Lee Jung Joo are friends from the get go and are friendly more than they fight so far. I love it when dramas skip the cliche hate to love relationships and switch it up a bit. I honestly believe that even he didn't think she was dying, he'd still want to help her out. That's just the kind of heart he has. Okay, so now for my nitpicking: I do like the character of Jung Joo and I do feel bad for her, but her day from hell was a bit cliche. That alone would have been fine. I don't hate cliches all that much, but what left me unsettled was that it was quite anti-climactic. All this build up to this bad stuff happening, she has one brief breakdown, and then it's not mentioned again. I just don't find it believable. Maybe it will come up again, but it bothered me enough to put this drama on caution for now. Overall I'd say I liked the drama. I am looking forward to future episodes and to see where it's going to go. I have faith in the Hong Sisters, that the anti-climactic action with Jung Joo will be more than made up for in the upcoming episodes. I even believe that there could be a reason for it that I may later come to defend. So for all those looking for an opinion as to whether it's worth a watch I'd say yes. Honestly, even if the drama stayed exactly what it is, I'd keep watching it. I'd just feel super frustrated. But again I'm not worried. I see the potential that this drama has. Already it has a lot of unique factors that give it that special Hong Sister's factor. I'll check in again at the end of the series to give you my complete opinion. Until then I'll be enjoying the tropical breeze blowing in from Jeju Island Gatsby.